This is another easy dinner. (I’m sure you get the idea that that’s my specialty!) 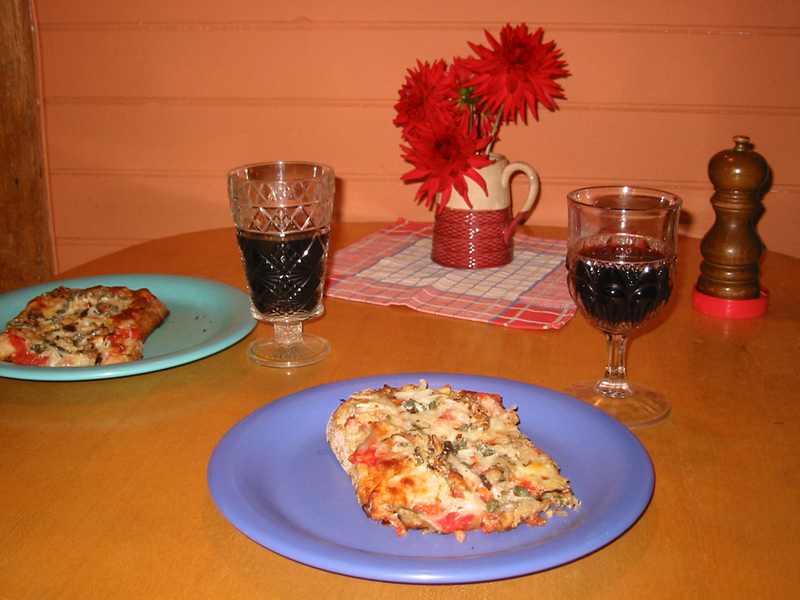 A stale loaf of artisan bread makes a great pizza crust. I tried it with a fresh loaf and it didn’t work well. Just ask Rachelle and Jim. 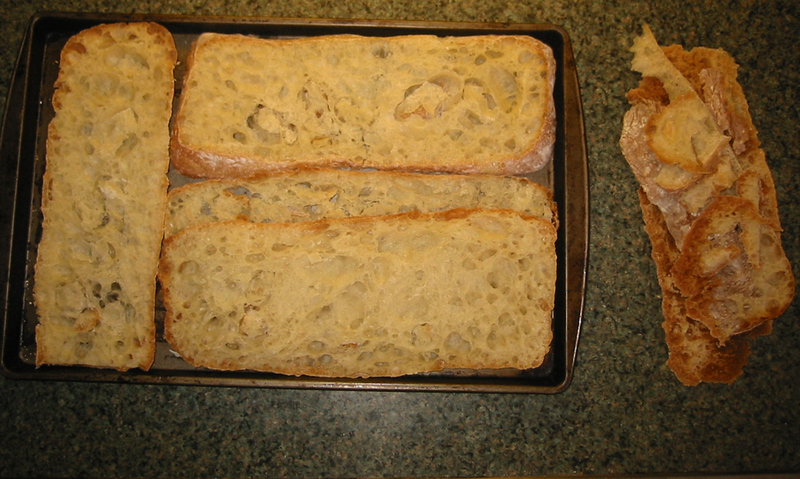 The fresh bread was too soft to hold the toppings and fell apart. You can call me if you want to rescue an old ciabatta from my freezer sometime. You’ll need the usual things for pizza. I always use a tomato layer of some kind, but I know it’s not essential. After that, the sky’s the limit. 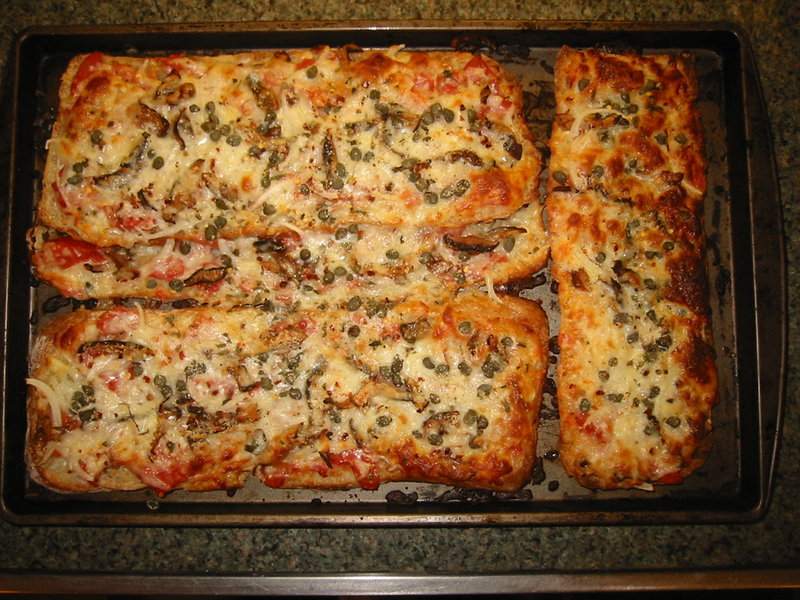 I used onions, mushrooms, capers, hot pepper flakes, oregano, mozzarella and parmesan. 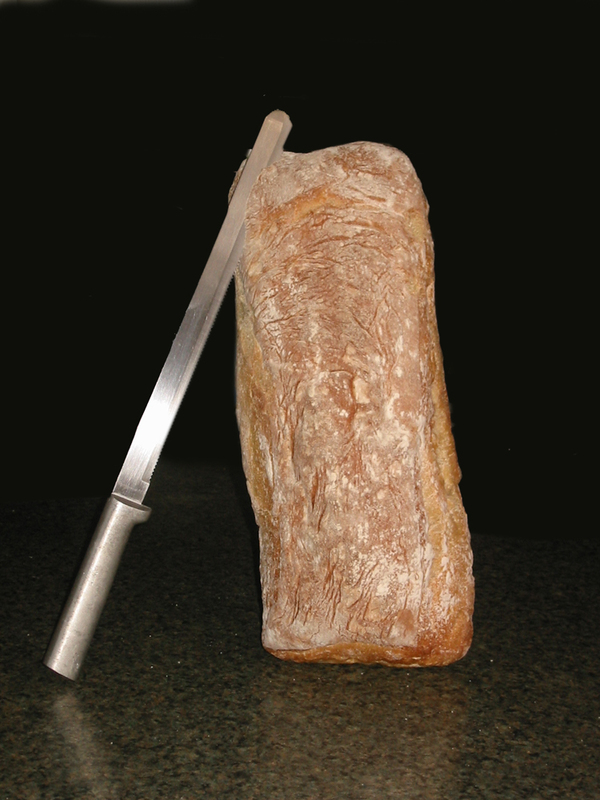 The only tricky part of this meal is slicing the loaf of bread horizontally into 3 or 4 good 1″ thick slices. You need a good serrated knife and a careful attitude. Don’t cut your fingers! It is helpful to take off the domed top of the loaf. 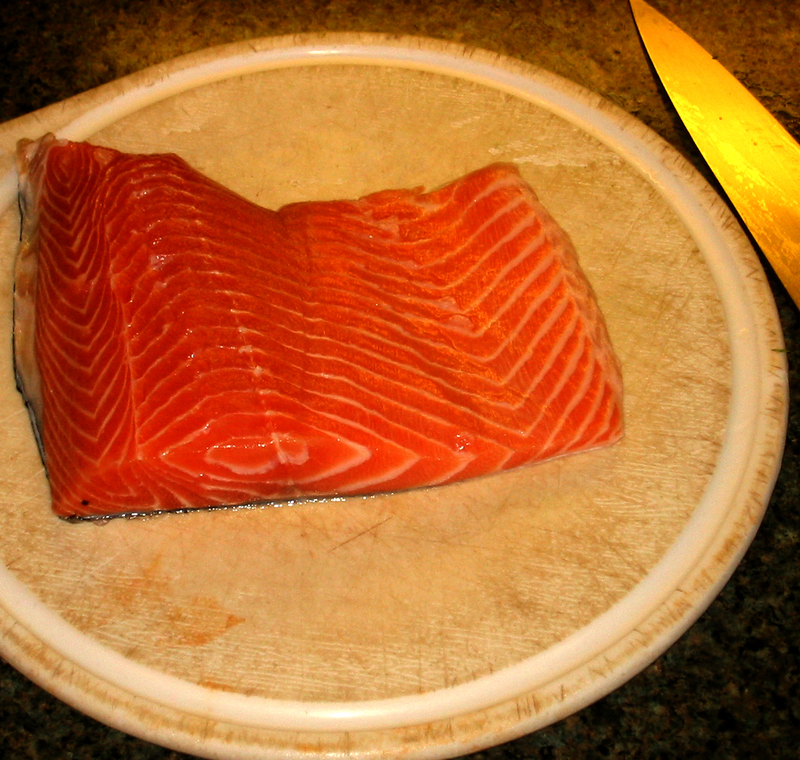 Also try to shave off some of the bottom crust, because it can gets hard in the oven. 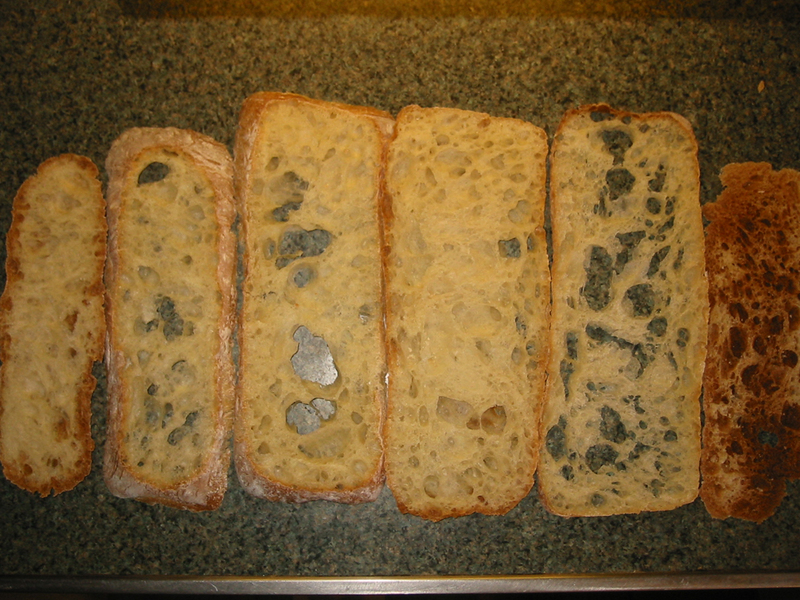 A nice, rectangular stale ciabatta. Sliced for pizza. You will use the pieces with way too many holes to patch the bigger holes in the other slices. This pan of sliced bread is ready for the toppings. The wastage is on the right. 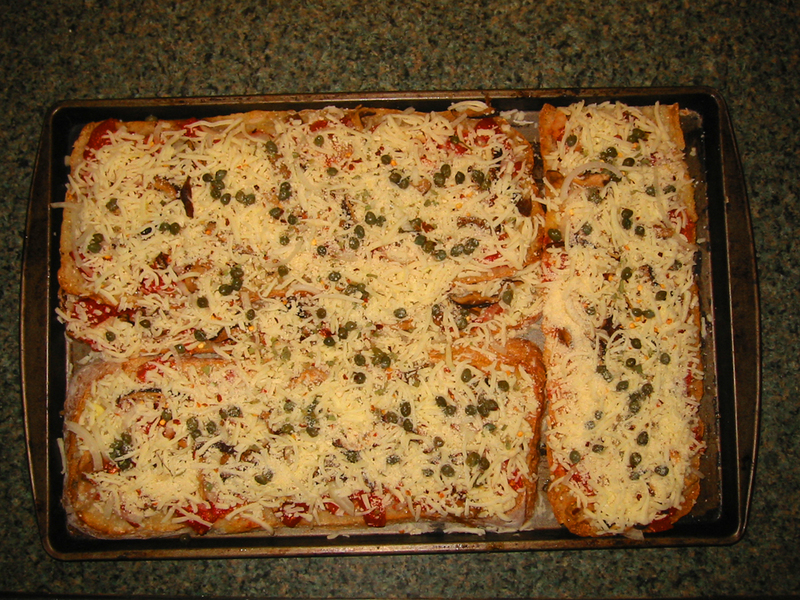 Mostly pieces of the top and bottom crusts. Before baking at 400 degrees for about 12-15 minutes. 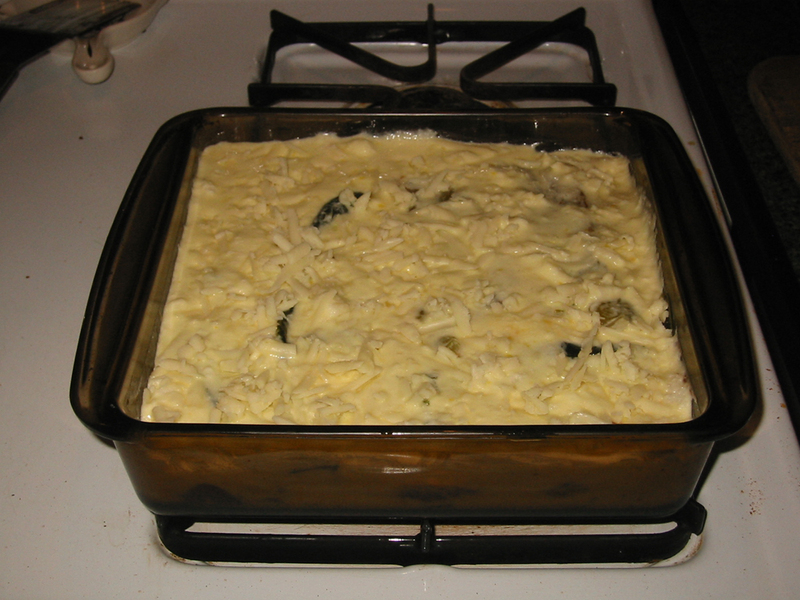 Remove from oven when there is some browning of the cheese. Tried and true. Hope you enjoyed the post! Mixed pole beans. The ones on the left side needed to be shelled. You see the situation. The pole beans almost got blown down during those strong winds a few weeks ago, but now they’e doing great. I picked a sink full. After a canner load, there were enough left to make one of my favorite recipes. 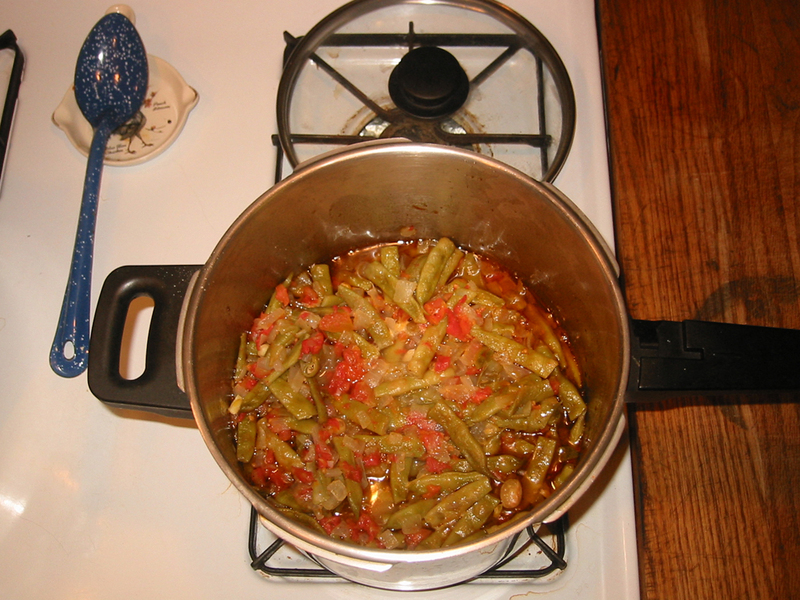 It is called “Slow Cooked Green Beans” in How to Cook Everything, by Mark Bittman. (It’s a great all-around cookbook.) 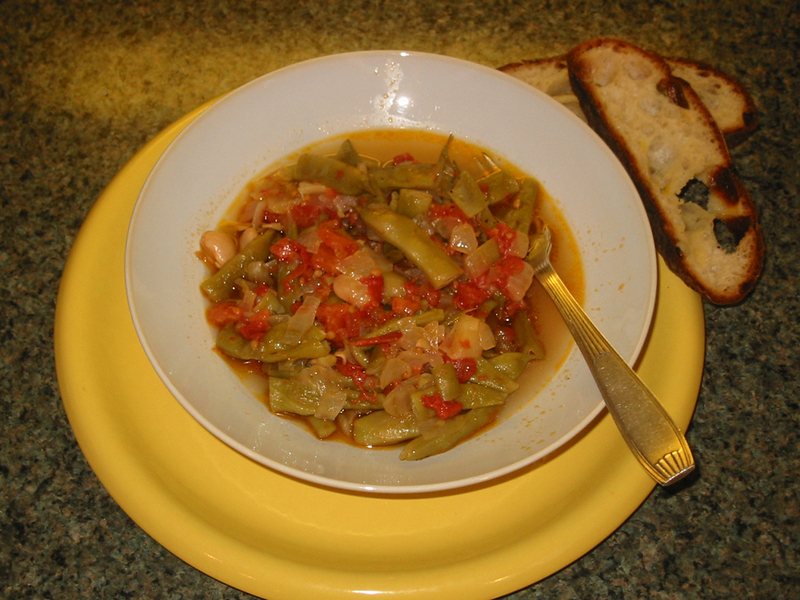 But to me, a better name for this recipe would be “Lucious Lemony Green Beans!” It has that delectable combination of tomatoes, lemon, and olive oil. Give it a try. There are lots of beans and tomatoes showing up at the Farmers Market on Wednesdays at Mill Race Park if you don’t have your own. This is a one-pot recipe, and there’s no reason to make it more complicated. I have changed the ratios a little, but not the ingredients or procedure.. 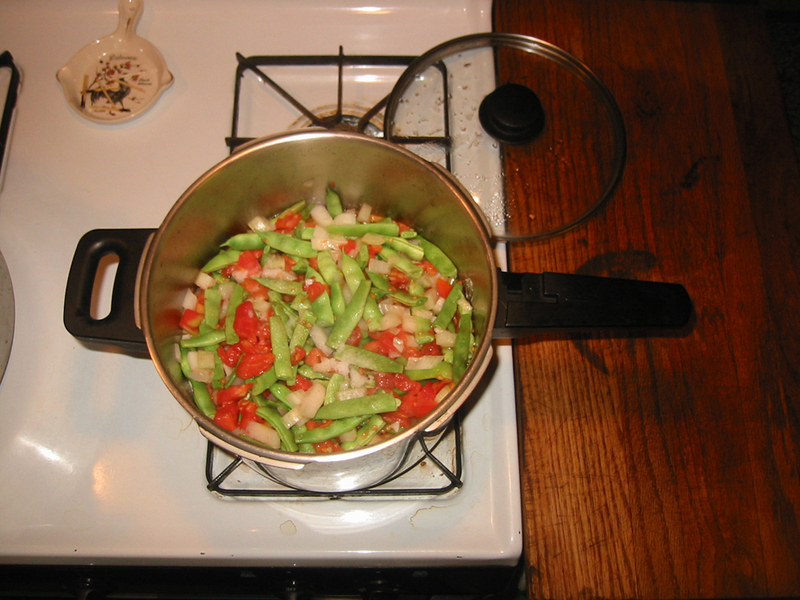 Into a large pot, put 1 1/2 pounds of trimmed grean beans, 2 cups of chopped tomatoes, 2 cups chopped onion, 1/4 cup olive oil, and the juice of one lemon. Add salt and pepper to taste. Turn the heat on low and cover the pot. You want the tomatoes to give up their liquid and the whole pot to simmer slowly for at least one hour, and up to two hours. Make sure it doesn’t dry out, but I have never had that problem. Open the pot and cook off some liquid if needed when you’re ready to eat. This is a simple and simply delicious thing to do with garden produce. 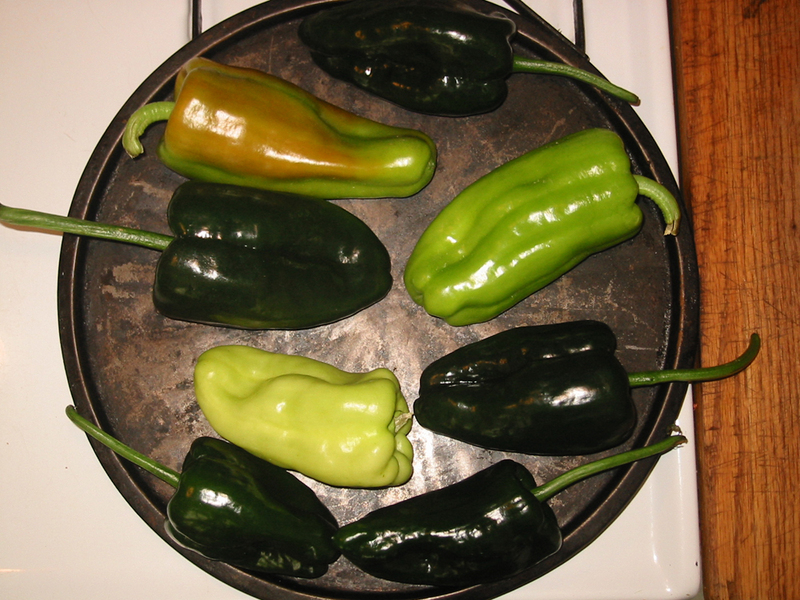 This recipe works well for canning or freezing also. Hope you like it! Here’s how it looks. Served with some good bread! Posted on August 23, 2011	by Mikie D.
Although the weather has been a little cool at night and pleasantly comfortable during the day, we are bound to have several more very hot days to enjoy this jazzed up light cream cheese and fresh-tasting raspberry and watermelon sauce dessert. Spoon or pipe cream cheese mixture into the indentation of each melon ball. In a blender or small food processor, combine watermelon, the 1/3 cup raspberries, the 2 teaspoons honey, and the dried lavender. Cover and blend or process until smooth. Press through a sieve to remove raspberry seeds. Spoon watermelon mixture around cheese-filled cantaloupe cups. If desired, garnish with the 1/4 cup raspberries and mint leaves. Something new for garden greens. I will venture to guess that Fresh Herb Kuku Sabzi will be new for almost all readers. We have a friend in Elkins who recently married a man from Iran. The cuisine of Iran is esteemed world-wide. 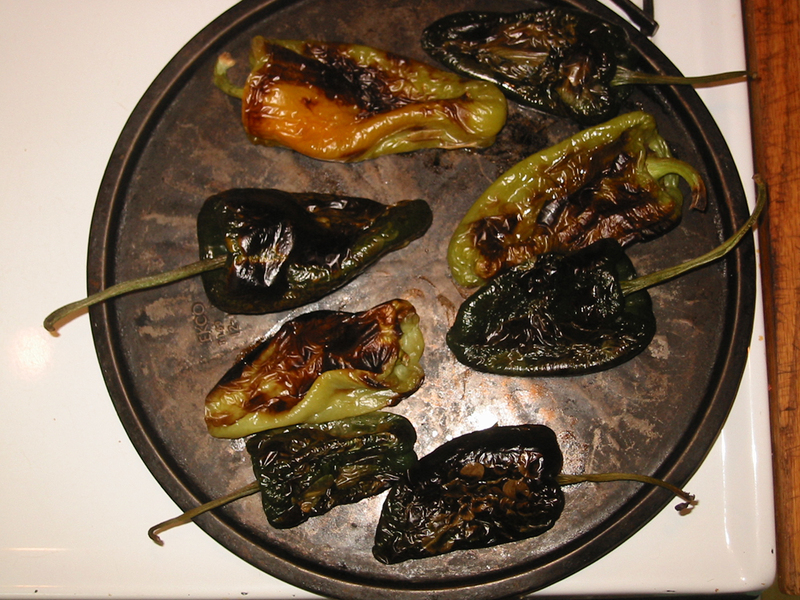 This is the first Persian recipe I have made my own. 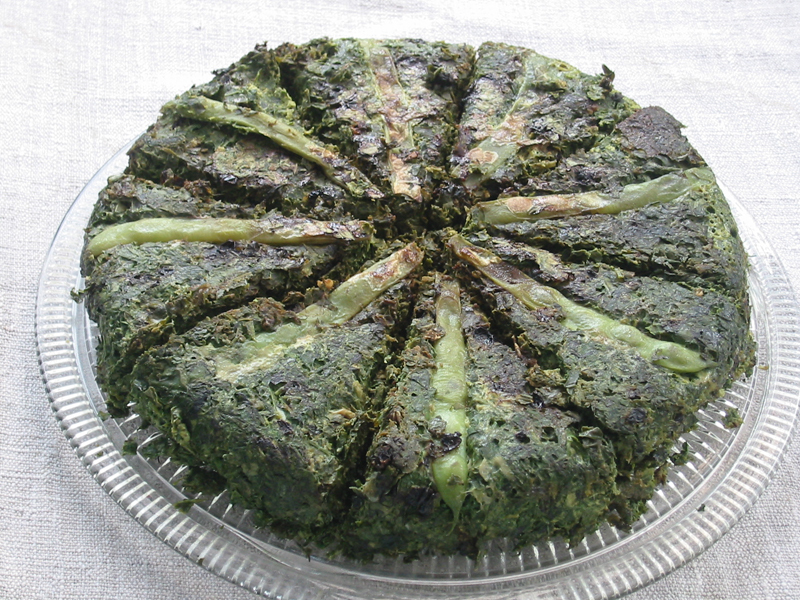 If you love fresh herbs and greens, you might like to try this. 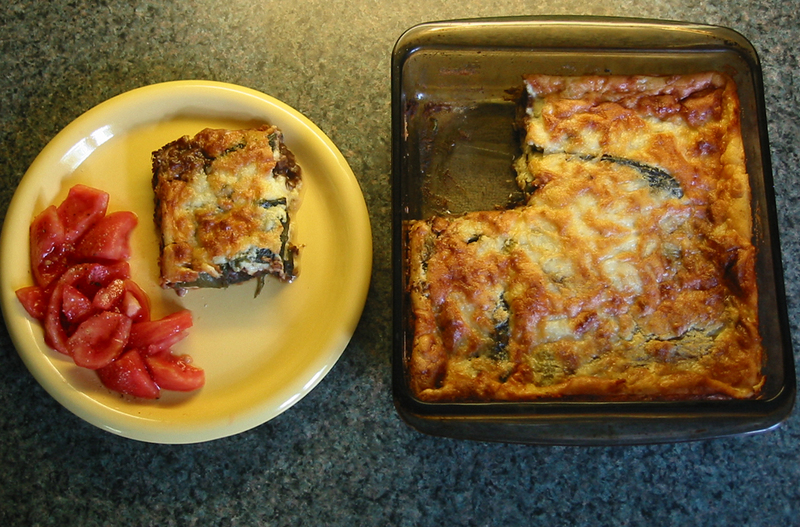 It’s not a last-minute dish; but it’s pretty easy, and tastes so healthy! Plus, it’s great hot or at room temperature. Start with a lot of mixed greens. Traditionally, they use a mixture of scallions, parsley, cilantro, and dill. Reza taught me to use these, plus whatever else is plentiful. 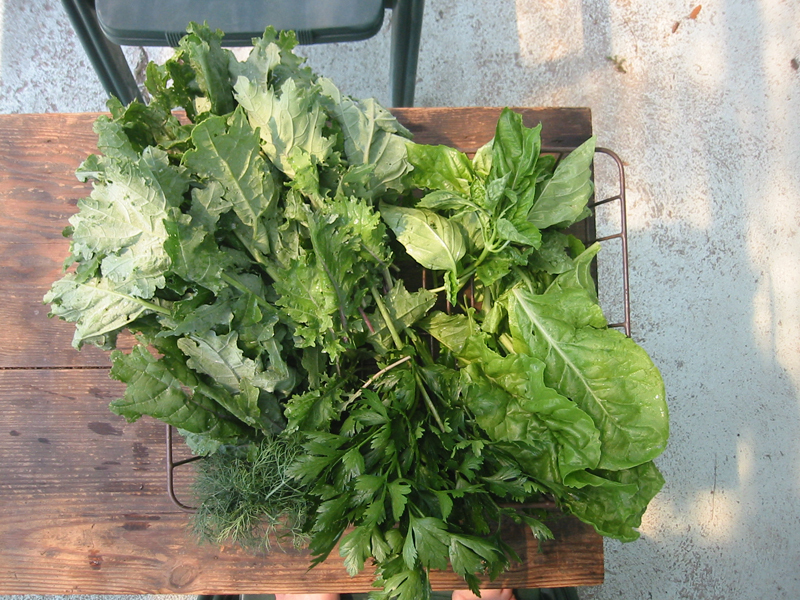 Mint, swiss chard, mustard greens, kale, and basil can all be included. 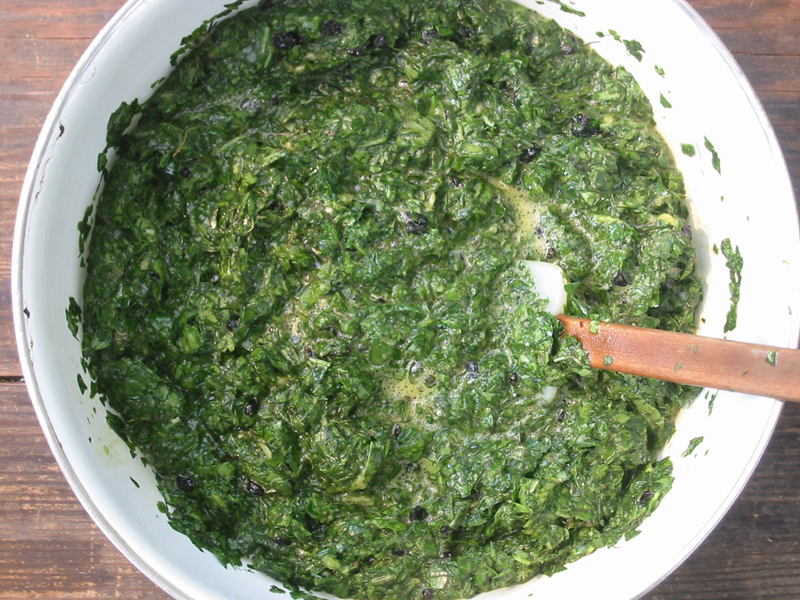 To make a large Fresh Herb Kuku, you’ll need 8-10 cups of chopped greens. 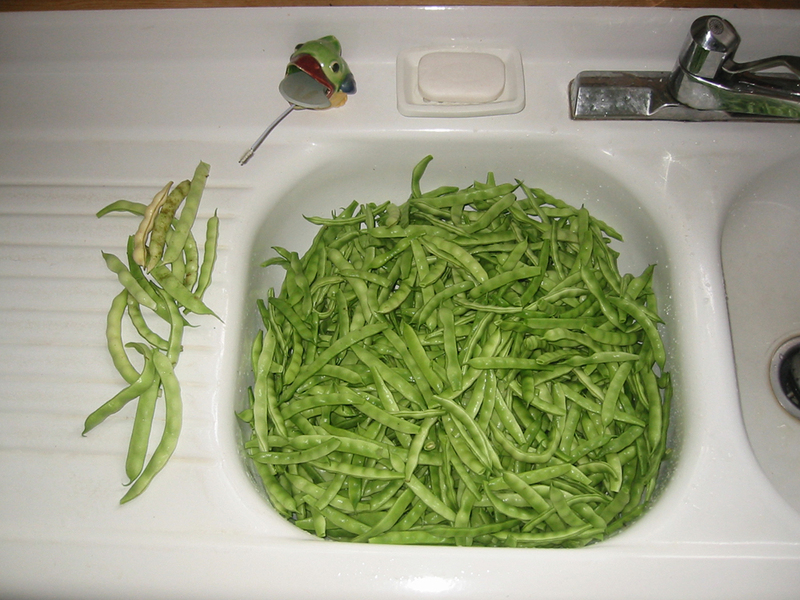 Here is a picture of the washed greens I used, all fresh from the garden. Unfortunately, I forgot to pick mint and cilantro (!) but I still had a flavorful mix. 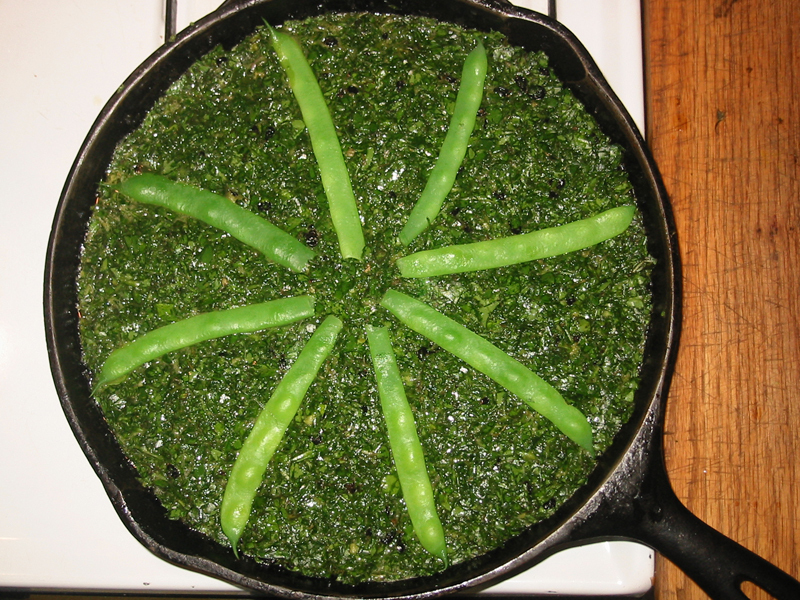 The more herbs you use, and the less kale and swiss chard, obviously the more flavorful your kuku will be. Dill is kind of important, the recipe I have calls for two cups of dill, so be brave with the herbs! They are meant to be the basis of the dish, not an accent. This is a good time to get out your food processor. Remove any tough ribs or stems, and process greens in batches till chopped. In another large bowl, break 10- 12 eggs and whisk lightly. Add a few crushed cloves of garlic, two finely chopped onions, 2 tablespoons of flour, 2 teaspoons of baking powder, a teaspoon of salt, half a teaspoon of ground black pepper. Two ingredients in an authentic kuku aren’t common here. Dried fenugreek leaves taste a lot like celery leaves to me, but they are even more aromatic. I think you could substitute fresh or dried celery leaves, or a few ribs of finely chopped celery. In place of 1/4 cup of the very tart dried barberries used in the middle east, you could use dried cranberries, currants or raisins. Mix all of these other ingredients into the eggs and then pour the egg mixture over the chopped greens. 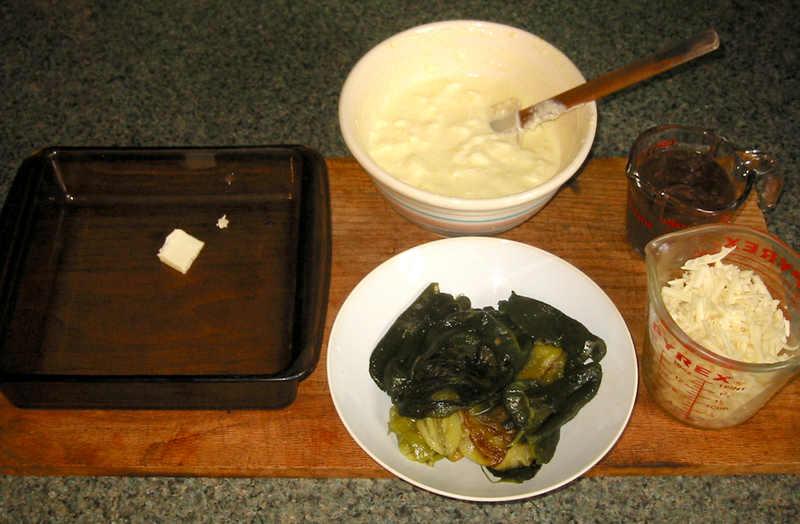 The resulting mixture will resemble a brilliant green pudding. The cooking requires an interesting new technique. 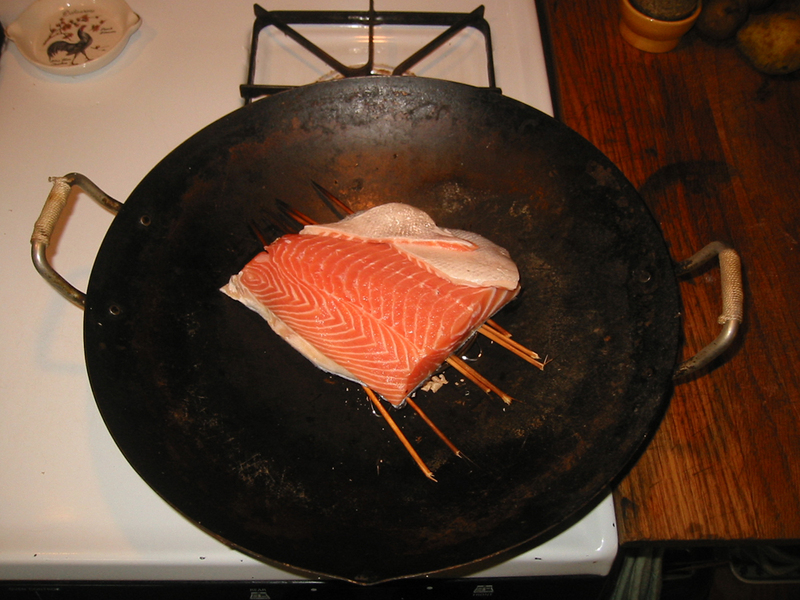 Preheat a large iron (or nonstick) skillet with a tablespoon of butter. Cooking the first side. 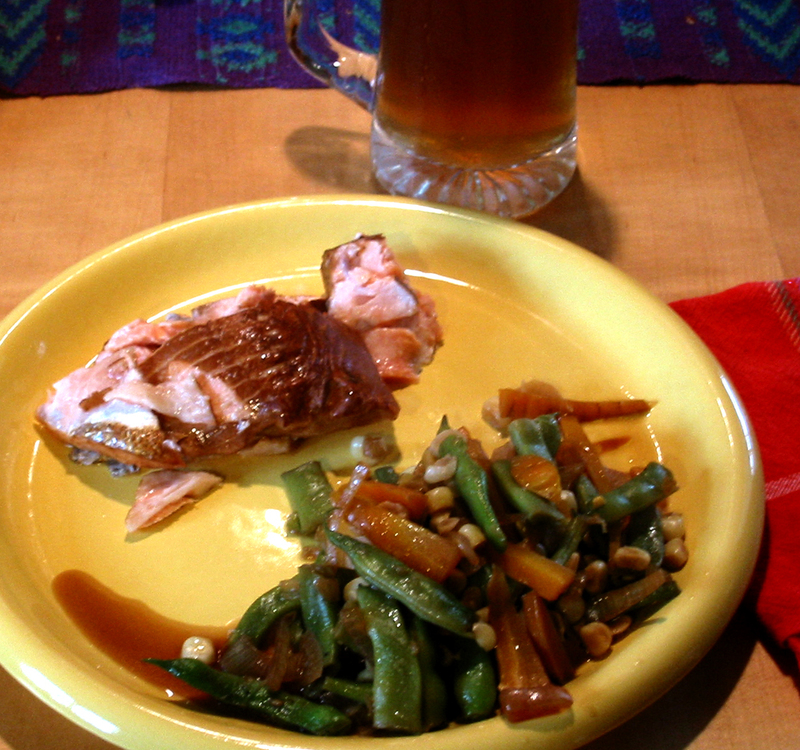 I added some steamed green beans for garnish. 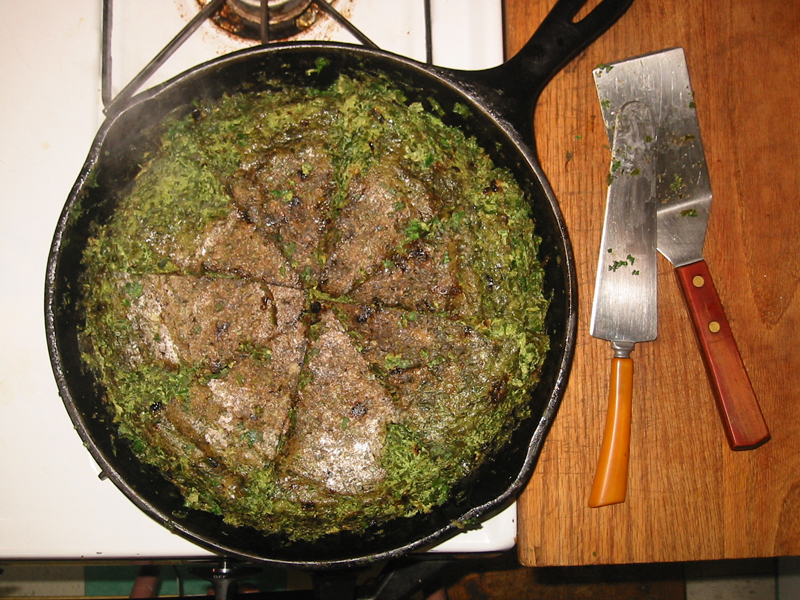 Pour in the greens/eggs mixture, cover the pan and turn the heat down low. 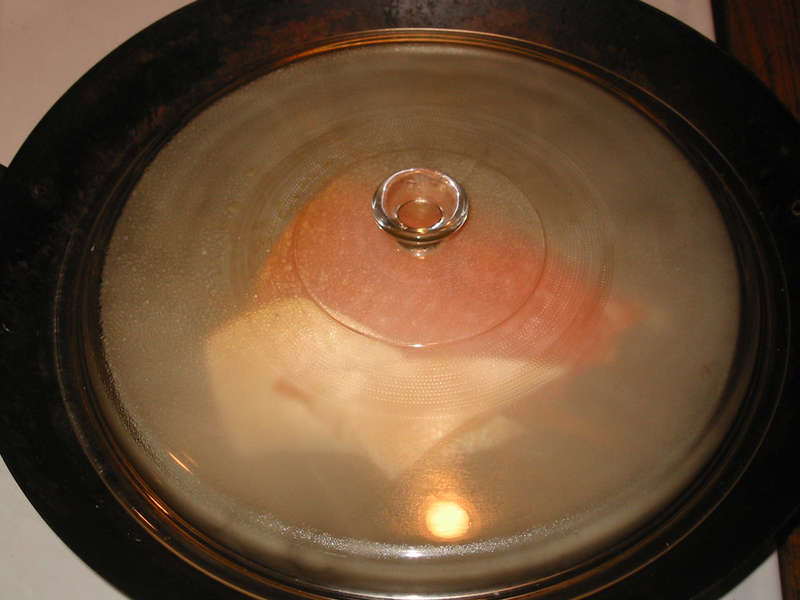 Let it cook for 25-30 minutes, until set. 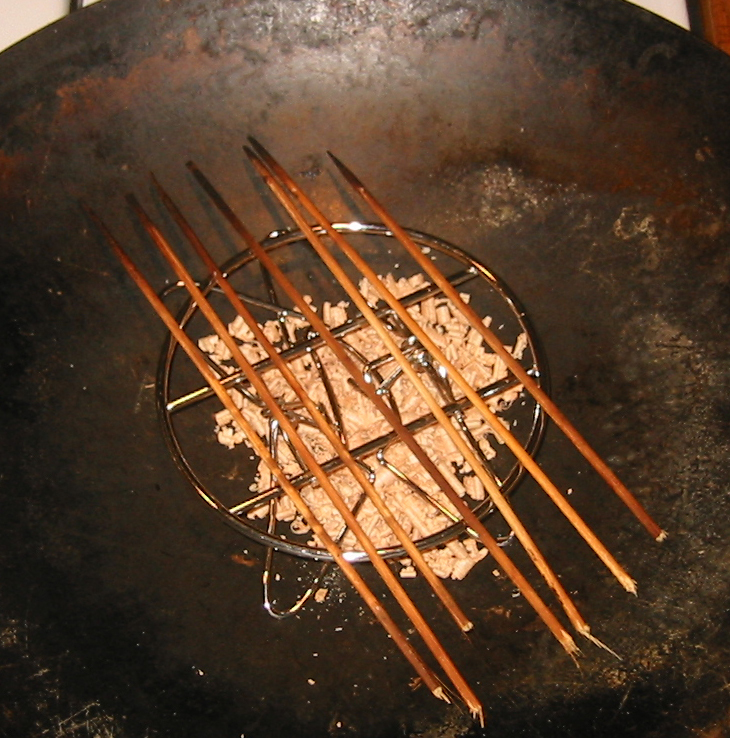 When the kuku has set, use a thin knife to cut it into wedges while still on the stove. 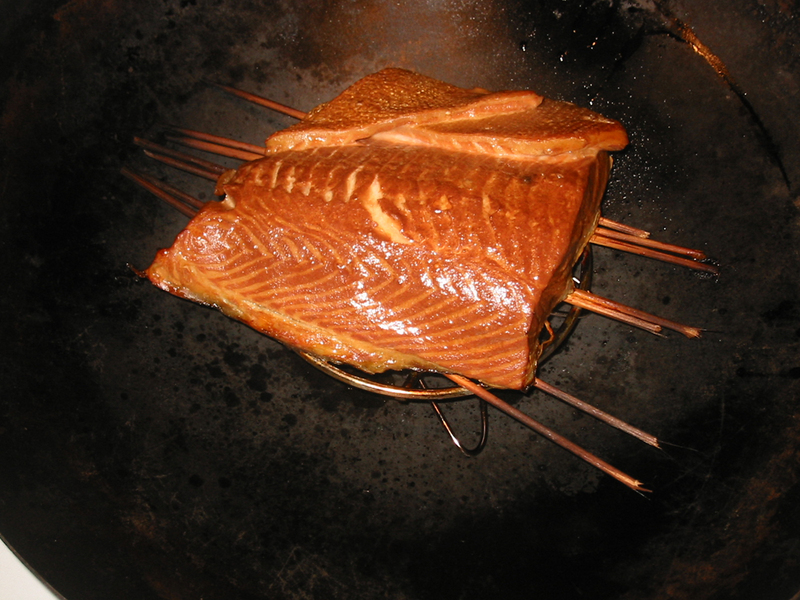 Carefully flip each wedge over, one at a time, adding more butter or oil if necessary. ( I have not needed to add any more.) Cover the pan again, and cook for another 20-25 minutes. 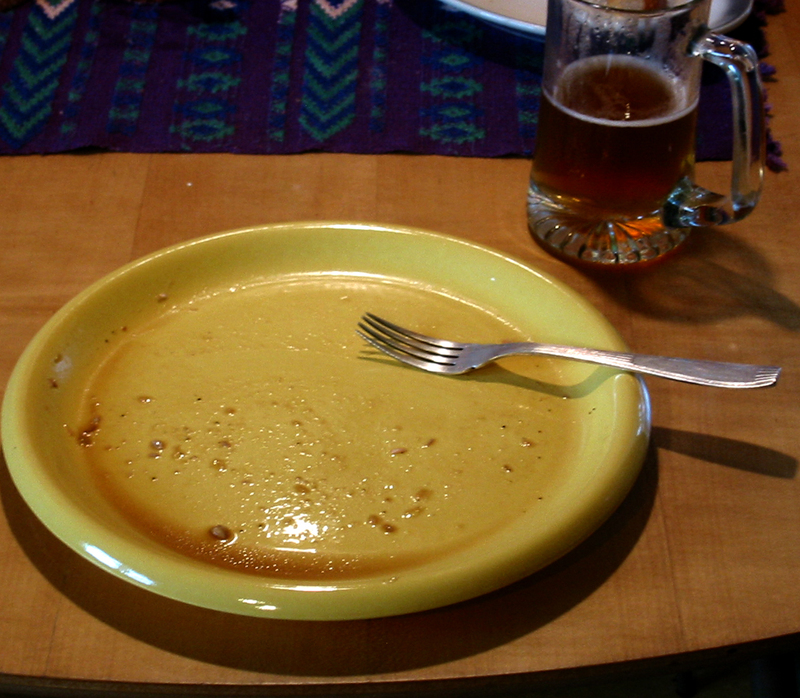 Turn out onto a platter. 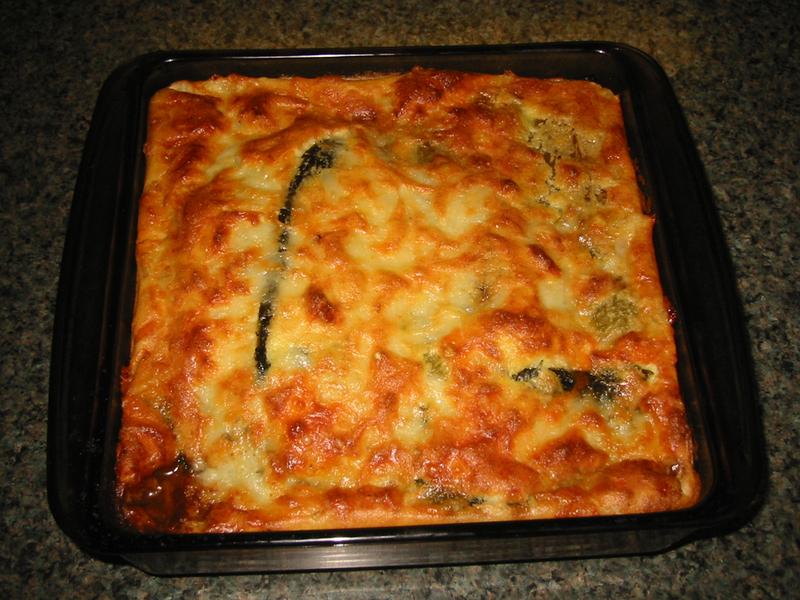 Kuku Sabzi, ready to serve. The kuku should be golden brown on both sides. 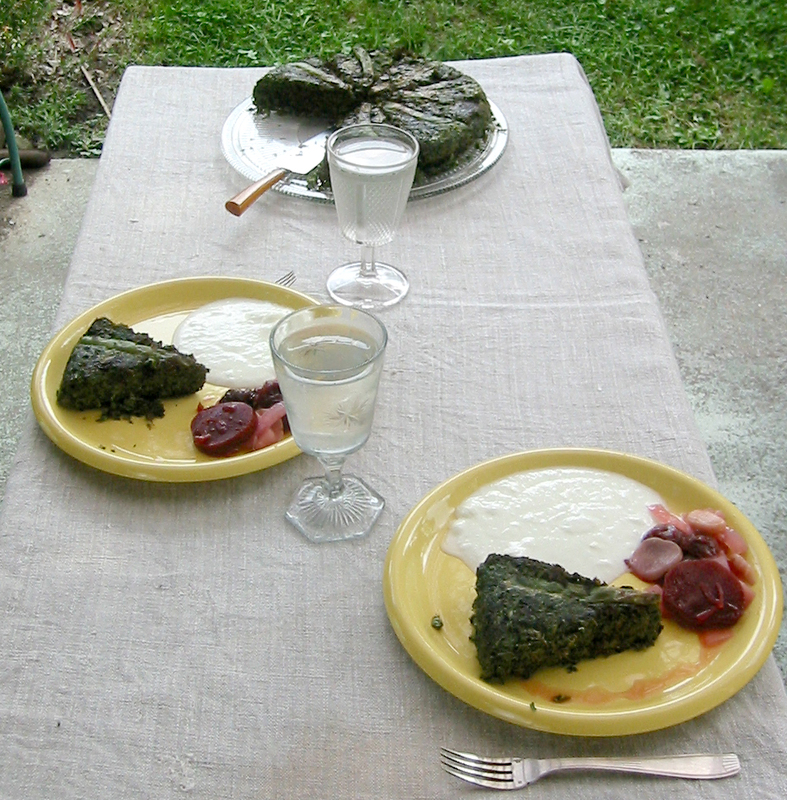 Today we ate it with yogurt and pickled beets.